Today’s animation is a carved stone beaver effigy form the collections of the Virginia Museum of Natural History. This item was donated without any contextual information so the antiquity of this object is unclear, as are its cultural origins and place of manufacture. Today’s animation is a doll head recovered archaeologically from a free African American site in Philadelphia, Pennsylvania and dates to the early 19th century A.D. It is now within the archaeological collections of The State Museum of Pennsylvania (TSMP). This doll head shows a woman wearing a hat and was scanned by now VCU alumnus Crystal Castleberry on February 7, 2013. It was animated by Lauren Volkers on May 5, 2014. Today’s animation is an Aztec figurine head from the collections of the Virginia Museum of Natural History (VMNH). It was scanned in August 2013 by Lauren Volkers, Ashley McCuistion, and myself in the VMNH archaeological collections area. Today’s animation is a small zoomorphic figurine head recovered archaeologically from the Hartwell site (44FX1847) in Fairfax County, Virginia. The figurine fragment was scanned at Fairfax County’s Cultural Resource Management and Protection collections repository in the James Lee Community Center, Falls Church, Virginia. The Virginia Museum of Natural History (VMNH) focuses their attention on studying animal remains from archaeological sites through their extensive faunal type collection. VMNH does also hold other collections of interest, including this clay figurine of a canine manufactured by the Aztecs. 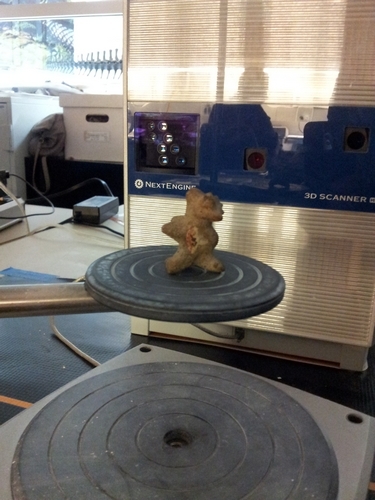 This figurine is actually quite small, as can be seen in this photograph of the object as it was being scanned.